The reveal and total cost for our low budget laundry room refresh. Finally. 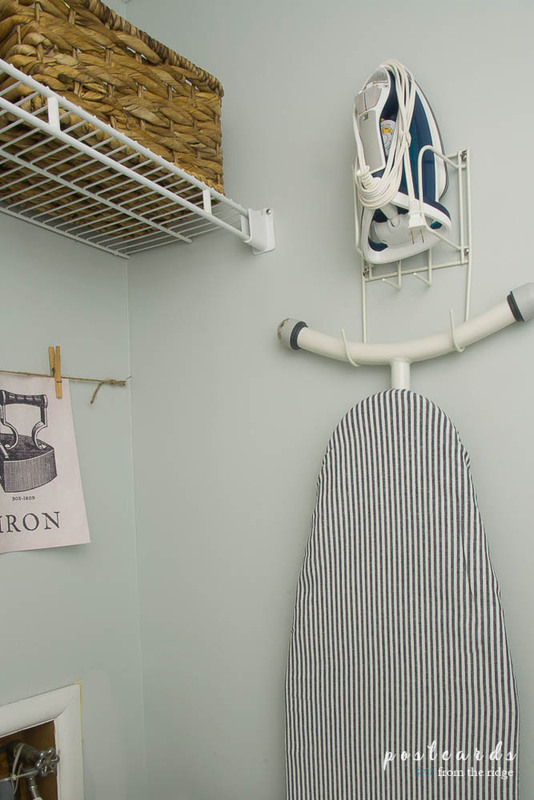 Our little laundry room makeover project is finished! And it's so much brighter and fresher in here that it's making me want to redo several more rooms. Does that ever happen to you? Redo one thing and then you want to redo so much more. I like to call it the domino effect and it happens to me all. the. time. 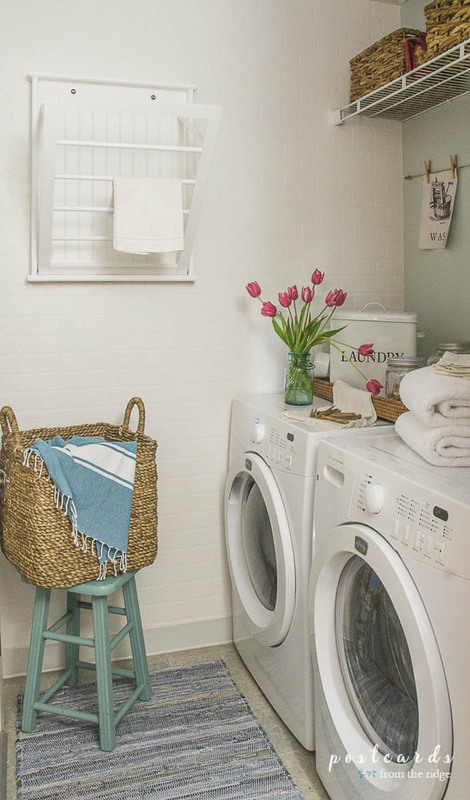 For now, let's focus on the refreshed teeny tiny laundry room. Here's how it all started. A group of home bloggers and myself decided to accept a challenge to makeover a room in our home for no more than $100. A big thanks to Erin at Lemon, Lavender, & Laundry for coordinating the whole thing. You can see all of the awesome room makeovers at the bottom of the page. You won't believe the talent and creativity in these projects! Knowing that $100 doesn't go very far when giving a room a makeover, I decided to stay small and try to use mostly things from my oversize stash. 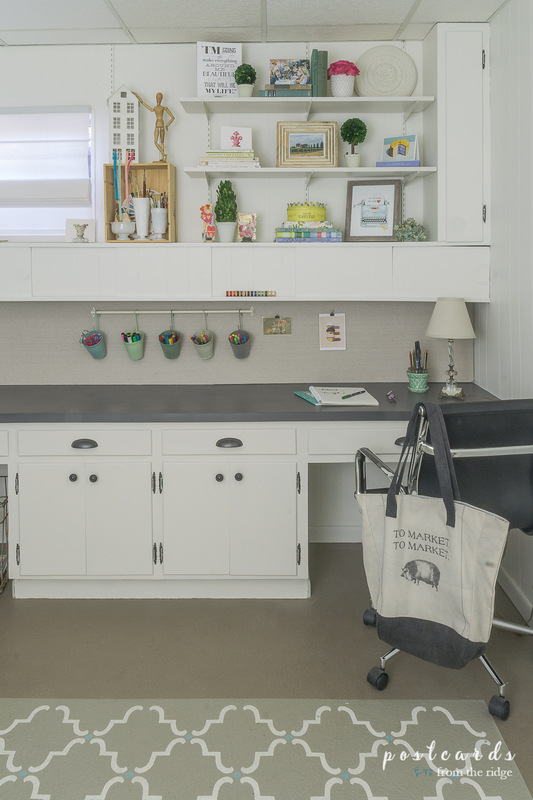 Our tiny laundry room desperately needed a refresh so it got the attention for this project. Here's what it looked like at the beginning of January. I was so over the yellow and the wood door. And apparently I did a sloppy job painting around the door the last time. Oops! I had purchased the rug to add a pop of color, which it did, but I was tired of it as well. 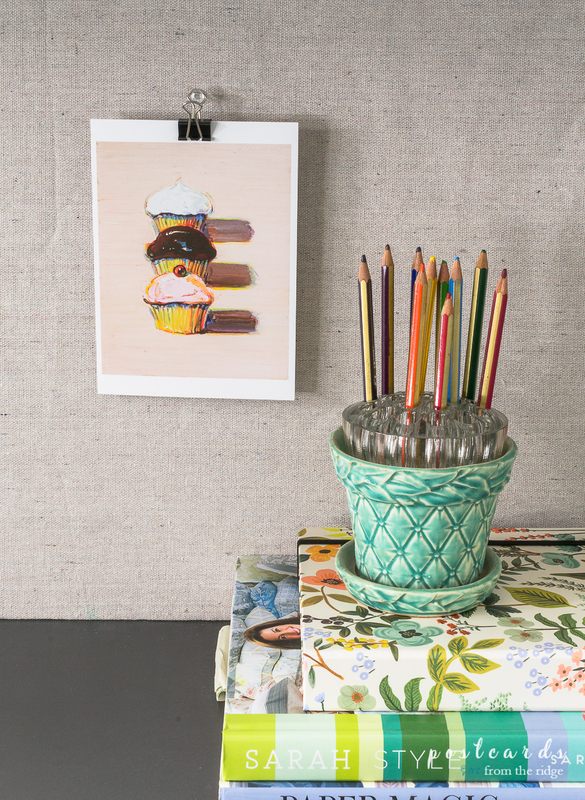 I knew I wanted to make the room lighter and fresher and that I had most of the supplies I would need to do it. Such a big difference in such a small space. This room is open to our kitchen so it's always in view and now I don't cringe when I see it. It's a tiny room, so small that you feel like you're in a closet. The lighter colors and softer rug help keep the space light and bright now and make it seem bigger than it really is. I had just enough brick wallpaper for the end wall. It's an outer wall that has brick on the outside and I wanted the illusion of painted brick. It looks so realistic, doesn't it? It turned out better than I had hoped! Here's a close up of the wallpaper. The texture is very authentic. As I was installing the wallpaper I made a how-to video and will be sharing it soon. I've never shared a how-to video before so you'll have to be forgiving, but I'll be showing all the steps for hanging wallpaper. I've been hanging it for years and hopefully will have some tips you find helpful. Stay tuned! I hope to have it posted soon. 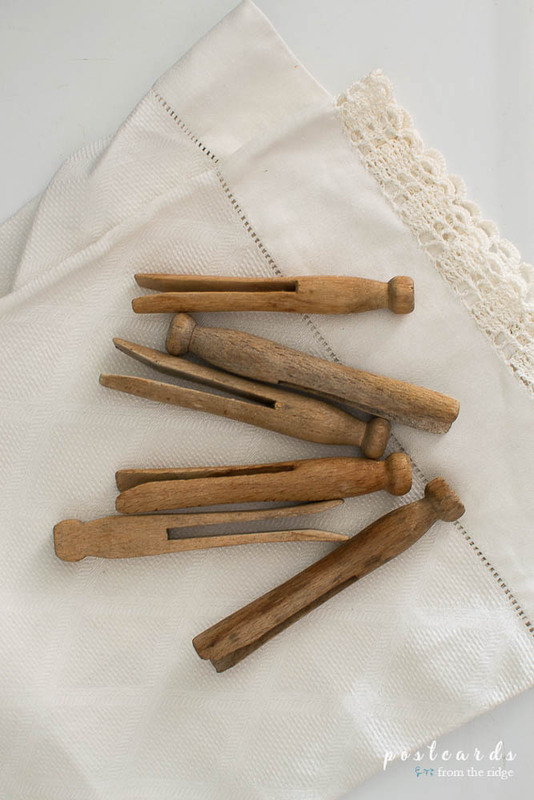 The vintage wooden clothes pins are some I've had for years. They were previously on the shelf above the washer and dryer. I didn't put them back up there and now I'm able to see them all the time. Why keep them stashed away? It's much more fun to have them down lower where they can be seen and enjoyed. New baskets on the top shelf help keep the space tidy. 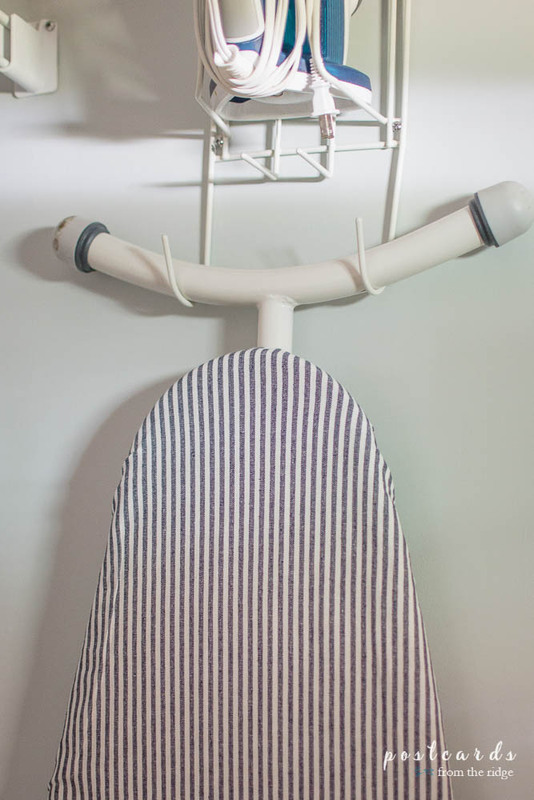 And a new cover for our ironing board gave it a fresh new look. It hangs up and out of the way with the iron on a wall mounted rack. 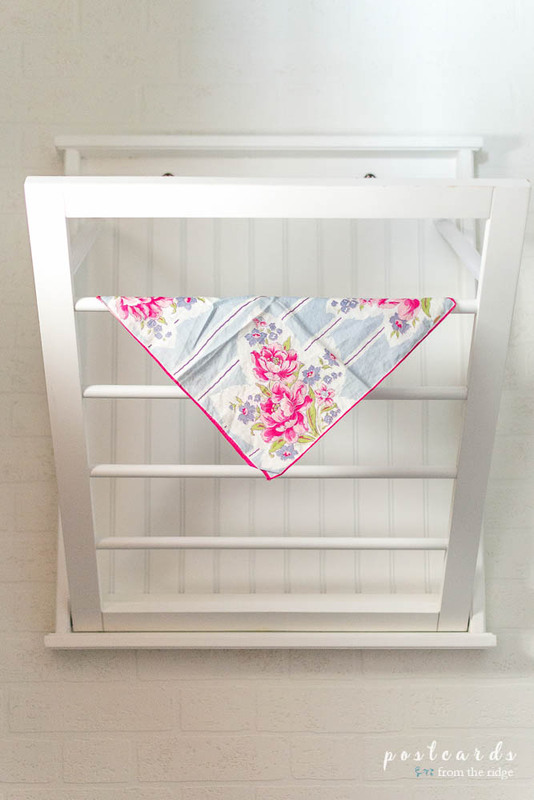 I've had the wall mounted drying rack for years and use it almost every time I wash clothes. 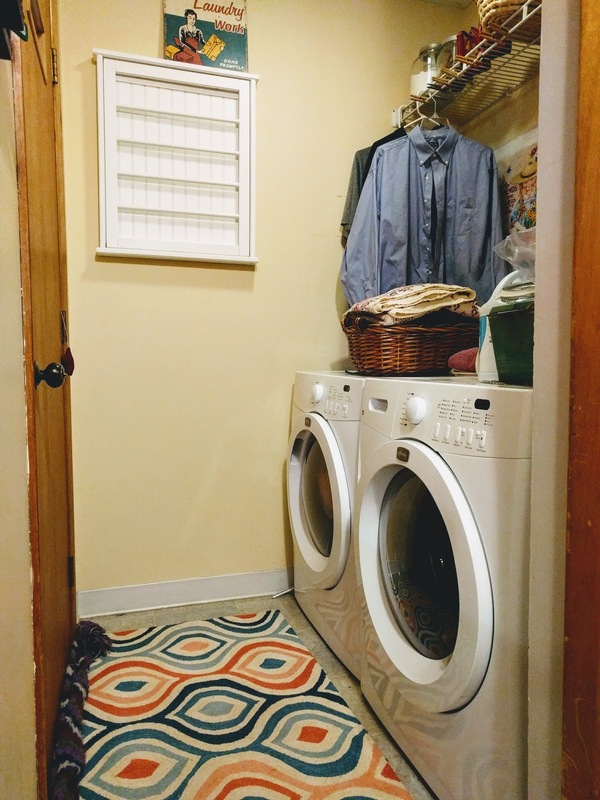 It's a great space saver and is perfect for small laundry rooms like ours. The metal laundry bin was also something I already had, but it was being used to store the kitty's bag of dry food. Isn't that where everyone keeps the cat food? Anyway, it got washed and is now where it belongs...in the laundry room. Bleach and dryer sheets are hidden inside of it. Some grocery store tulips in a vintage mason jar add a pop of color, and the woven tray adds some texture. I already had some items on hand, either in this room, in my paint/wallpaper/tool stash, or being used somewhere else in the house. ＄0 The vintage artwork was something I created from free online graphics and then printed them and hung them with clothespins on a piece of twine. I had these on hand as well. 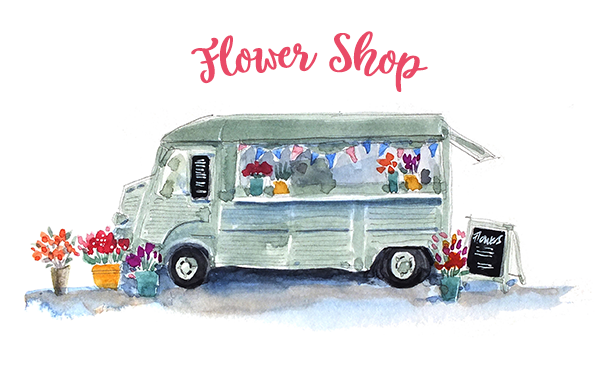 vintage themed artwork can be found HERE. Not bad for a complete makeover! I guess sometimes it's a good thing to have too much stuff. Wallpaper and Door color - Benjamin Moore White Dove, eggshell finish on the wallpaper, satin finish on the door. What do you think? It looks like a brand new space, doesn't it? I thoroughly enjoyed this challenge because it made me think outside the box and get really creative. 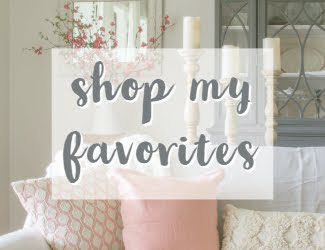 When my husband and I were newlyweds 25 years ago we had a tiny budget so I learned to stretch our dollars on everything, including home decor. Our budget isn't quite as tight these days but I still love projects like this. The next time you're tired of the way a room looks, shop your house, get creative, spend a few dollars and a little time. Before you know it you'll have a fresh space that you love. Have you done any low budget room makeovers? How did you do it? 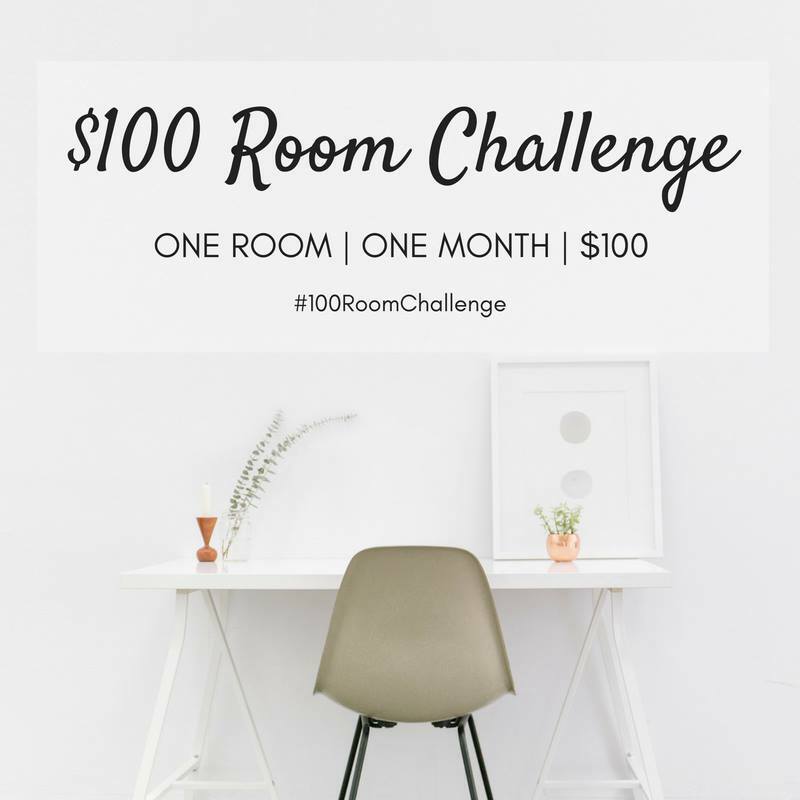 Don't forget to keep scrolling to the bottom of the page to see all the $100 room makeovers! It's definitely refreshed. So bright and probably a joy to use now. Great job. Thanks Patti. It is actually enjoyable being in that room now! Bravo! What a difference. Hey if we have to do laundry might as well be in a pretty place! Thanks, Kris! You're so right...might as well make it pretty! 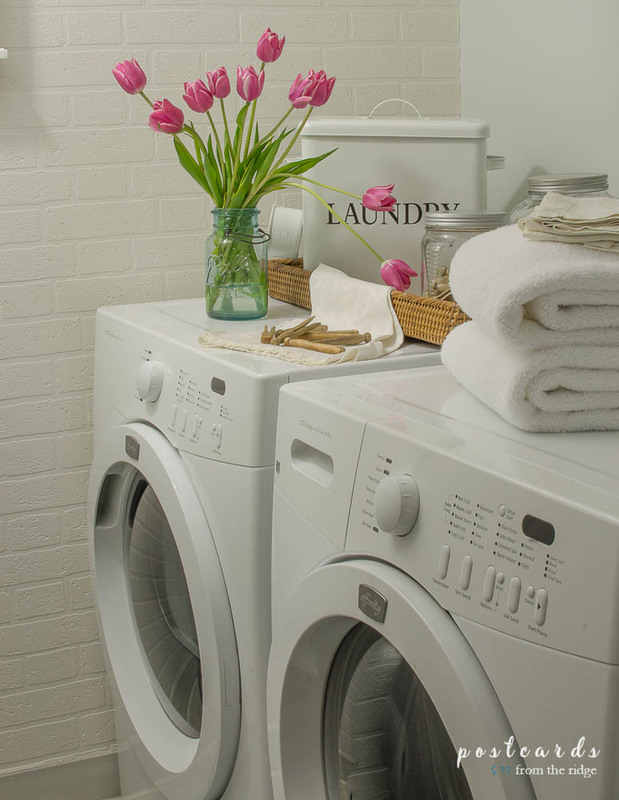 Your laundry room looks amazing, Angie! If we have to do chores, we might as well do it in a pretty place. I completely agree! Make it pretty and then doing laundry doesn't seem like such a chore. I mean....come on!!!!!!!!!!! WOWZERS Be still my laundry room heart! It does look so much brighter! You really made your budget and time count. 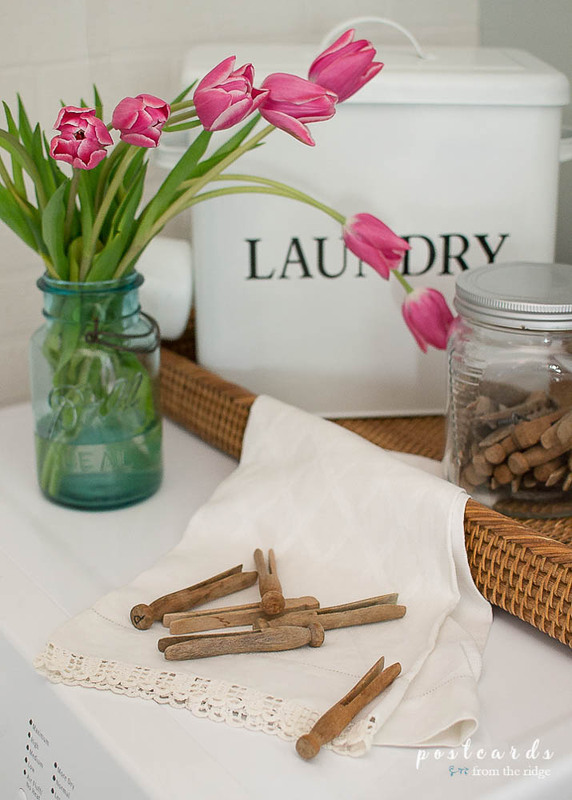 Adding my laundry room to my "domino" list as well! The space is so bright and airy now. That brick wallpaper makes the space. I love it all so much. You did a great job! Wow, what a great makeover. So much brighter, and that brick wallpaper makes such a difference! Nice work girl! It looks amazing! I can't believe you only spent 78 dollars!! Oh yes! This is so good! I love those printables! Amazing! The whole room looks so fresh and light! This space looks ah-mazing!!! It is so bright and fresh. The brick wallpaper adds a great texture to the room, and painting the door made a world of difference. 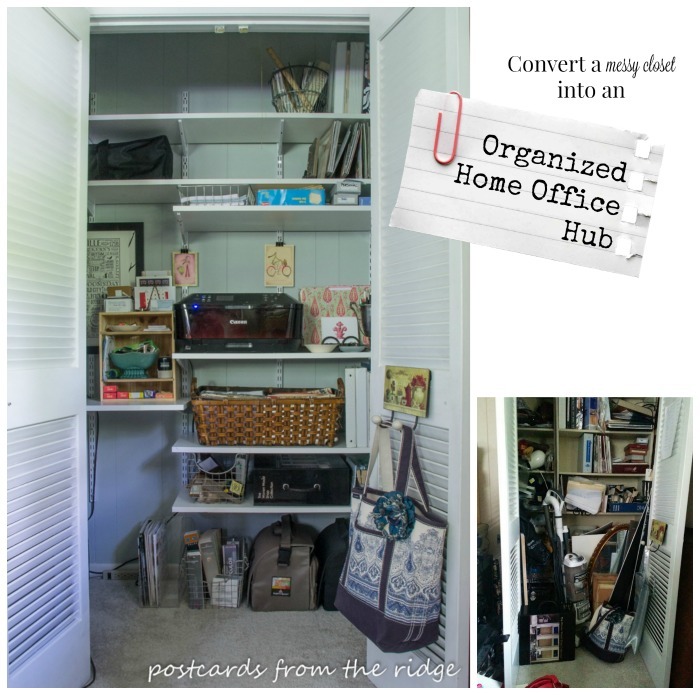 It's amazing how items from around the house can take on a new life in a different spaces. Beautiful job! I love it! It's beautiful! By the way, the last step on your list was by far the best of all! Wow what a transformation to such a tiny space! I'd be happy to do laundry in there! Way to finish the space! I can see why you would want to do laundry now! What a bright and happy space to do a boring chore. It is styled beautifully too. That faux brick wall is amazing! Okay, now I wish I had added more cute artwork to our laundry room re-do! Super cute prints. And that wallpaper is fabulous! Great result - so much better! It is so light and bright and pretty! The pink tulips add the perfect touch. What a beautiful place to do laundry. You did amazing with your budget. Having classic items to work with in the first place is a great lesson here and one I'll keep in mind when shopping. 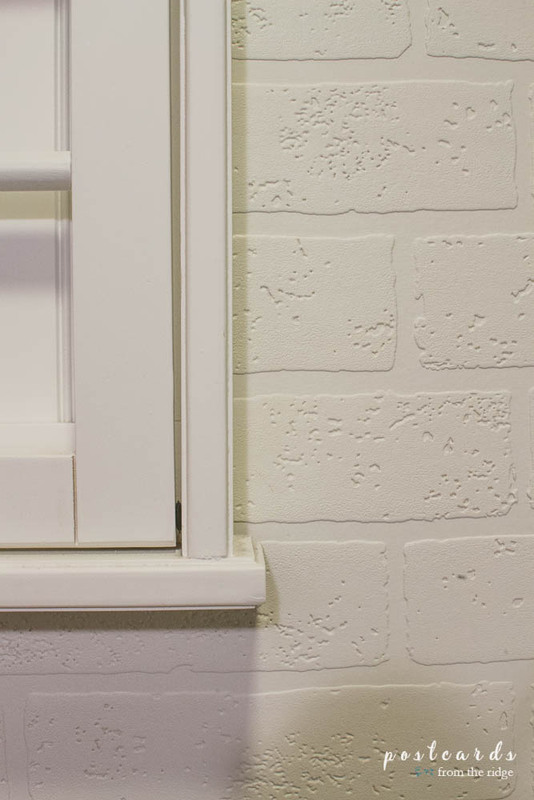 Love the faux brick and your whole transformation! You did such a beautiful job on your laundry room. Its so fresh and airy vibe.I love all white. Oh my gosh, this is wonderful! I'm collecting ideas for my laundry area makeover this spring. 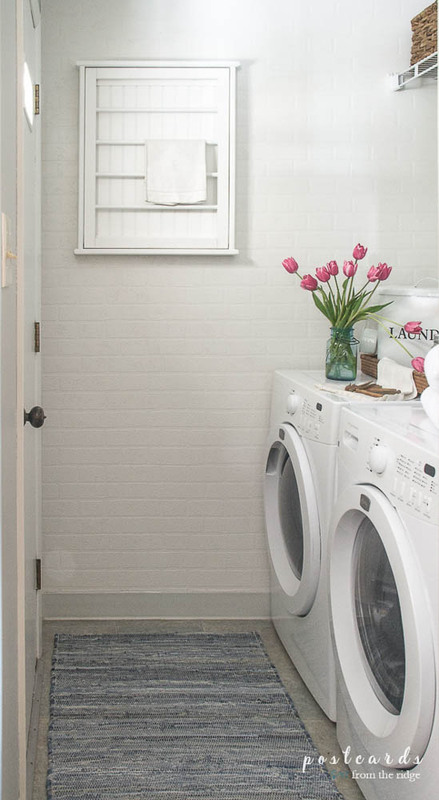 The faux brick is fanstastic and even I wouldn't mind doing laundry in a room such as this! Angie, your laundry room is just so beautiful! 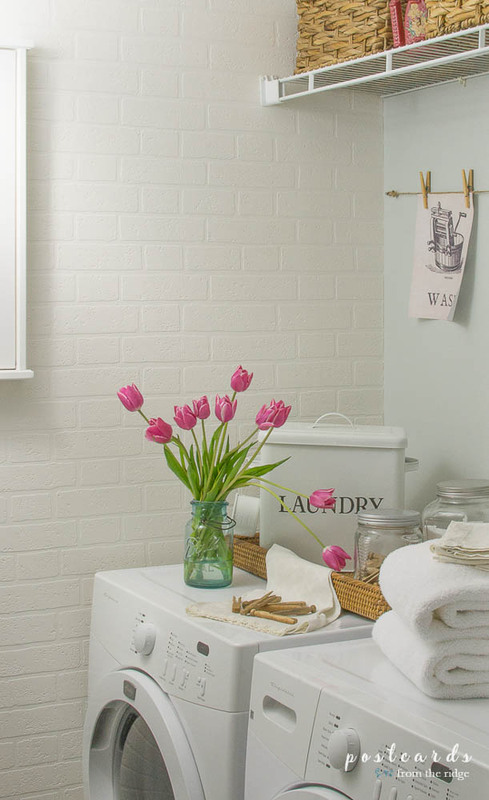 Love the makeover, from the brick wallpaper, the color on the wall, to the printables, and pretty decor items on top of the wash and dryer - it is all perfect! Nicely done! This room turned out so beautiful! It is so light and bright now! And I love that you were able to use so many items you already had. What a gorgeous makeover! You did an amazing job on this room. 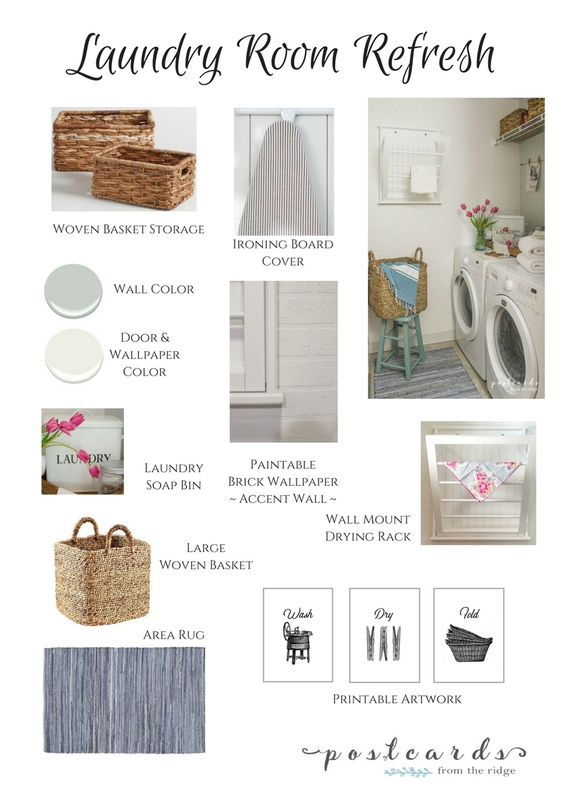 I'm definitely going to be stealing some of your ideas when we redo our laundry room! 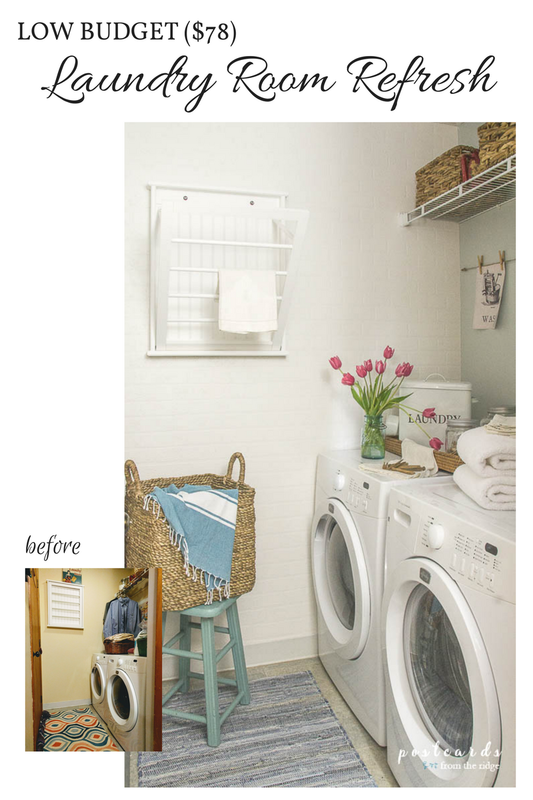 Angie, I loved how you reused items you already had on hand to create a fantastic looking laundry room. The "brick wall" was a super decorative element. I've been trying to download the printables. I added the box app, but I can't find a print option. I copied to my Mac,but it only wants to print the page with download info, but the actual printables. Would love to use these in our laundry room redo. Any suggestions? Hi! Beautiful job! 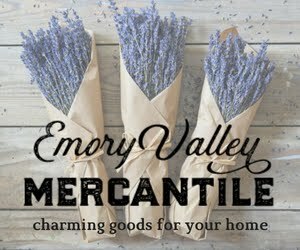 Where do I find the vintage art free printables? I would love to download them. Thanks!